Alan figured into his original JENAL plan, a form of long-distance land transport. He observed from other barges that cars could be cumbersome on a smallish barge and space consuming. Bicycles are great but not for eating up miles when time was of the essence and besides, he enjoys motor-biking even if Jennie is less impressed. For onboard bike storage see Bow Locker Storage page. His original biking plan was his big BMW R1200GS but the enforced delay of sailing JENAL gave him time on his hands so he fell in 'love' with an Italian, the Benelli 900 Sei to be precise and at the same time believed a classic bike would be more in-keeping with a classic Klipper barge. The bonus would be an acquired in-depth Benelli 900 Sei knowledge where the BMW needed a 'techie' to resolve any mechanical malfunctions. Alan being Alan he didn't want to go the simple route and simply purchase a 6 cylinder Benelli, he liked the technically advanced (all period relative) Benelli 900 but preferred the visually classic and stimulating original - Alejandro de Tomaso's 750 Sei design. So he set about converting his locally purchased and sadly neglected 30 year old 900 into a 750 lookalike, albeit in a different colour plus much technical upgrading. The below pictures outline his workshop story and clicking on each small picture can take you to an enlargement. 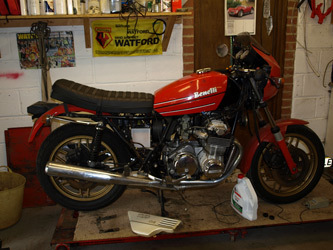 His detailed story was published in 6 episodes for British - Classic Bike Guide magazine starting issue No: 253 May 2012. For those of us who might be borderline anoraks, the sidebar information found in the 5 boxes directly below may enlighten. 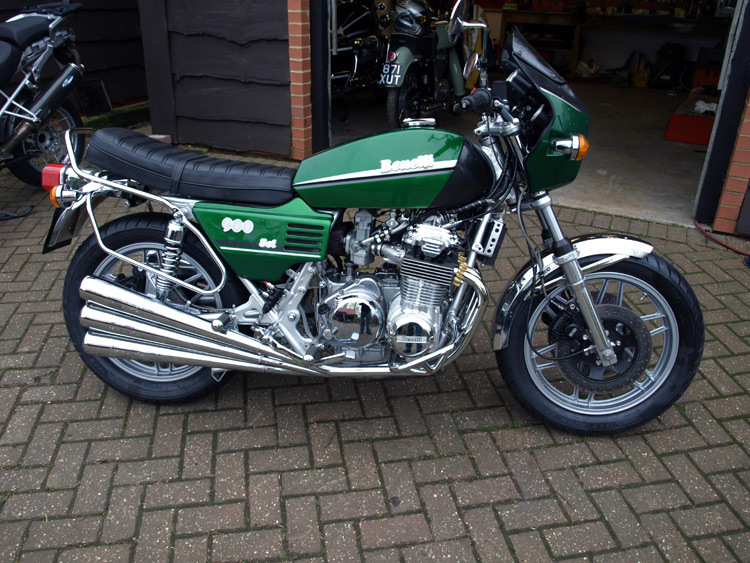 Alan gives organised talks on his Benelli design and build - please see presentations page. 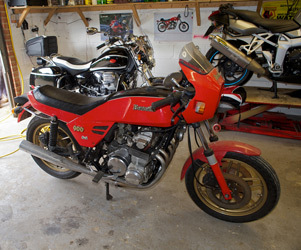 1) The first day of getting the unused and unloved Benelli 900 Sei to friend Simon's garage ready for planned restoration. 2) The start of the stripping of the bike down to bare chassis. 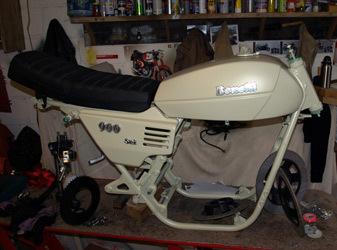 Note the small fuel tank hidden under the standard 900 Sei fibre glass paneling. 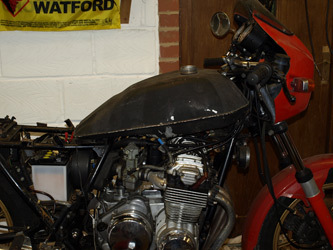 3) We trial fitted the second hand 750 Sei fuel tank and seat to see what mods were required. The tank was an easy alteration to its fittings but the seat would require a new set of steel fabricated mountings for both the seat hinge and its locking mechanism. 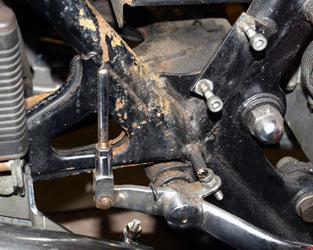 4) A closer view of the front suspension showed us the lack of attention this poor specimen of a bike had received over the years. 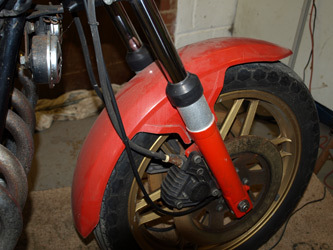 The brakes were seized on and the forks were poorly painted. No problem because they would both be rebuilt with the forks being stripped of their reddish paint and returned to polished aluminum. 5) The six into six exhaust system arrived from Italian supplier Coco's Garage. Unchromed and unmarked so Alan had to initially discover which part went where. 6) As can be witnessed by this picture, the stock 750 exhaust system looks ridiculous on the 900 because the 900 Sei's engine is mounted more upright to assist in bike balance and handling. 7) The poor old 900 was in a sorry state when Alan first started stripping it. Battery acid had boiled over and run down the frame corroding all in its path. 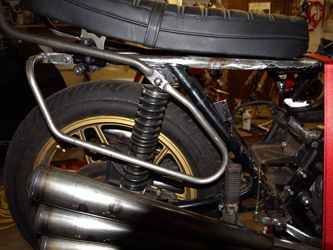 8) Part of the modifications are underway here, carried out by DULA Engineering who have made the new seat mountings, exhaust changes and added some extra bars. 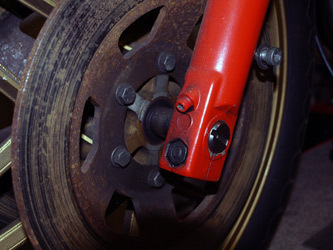 9) The front disc brake and fork leg were in a poor state. 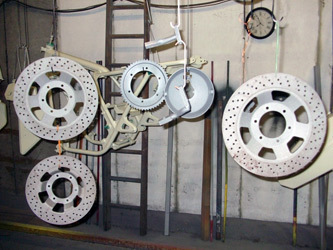 The discs' were shot-blasted and the leg to the metal treatment specialists Baker Engineering for polishing. 10) More mucky bits, in particular the front end awaiting its strip-down. 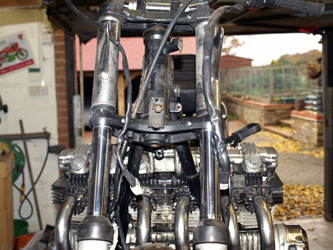 The bike had recently returned from DULA and the now correctly fitting exhaust pipes can be seen on the engine. 11) Hardly anything is left on the bike save hauling out the engine and transmission and a few other items. 12) These unusual items are the old and new OHC timing chain tensioner. The original black one at the top had sat in this engine for some 30 plus years and renowned for failing if not used. 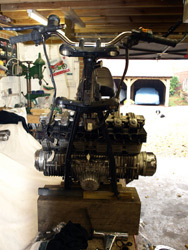 13) The engine had only covered 4500 miles in its 30+ years of existence so it theoretically didn't need re-building. 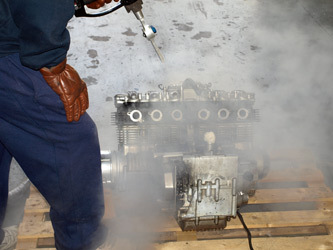 It needed a big clean and repaint though - Ice Blasting was suggested as the best way of cleaning it. 14) Benelli 6 cylinder engines are only air-cooled and susceptible to overheating, not so much from high speed touring but more from traffic congestion where limited amounts of air pass over the engine. An external oil cooler is the answer. 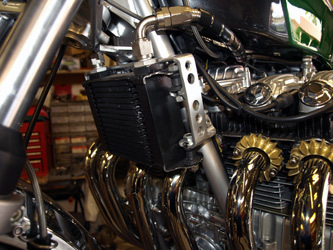 15) The oil radiator fits in its own rubber mounted steel housing just below the steering head-stock. It replaces the Benelli's original twin horns which were replaced and repositioned under the seat. 16) Benelli Sei's have a torturous air flow route from their under seat air cleaner to the triple Dellorto carbs so we turned to K&N Air Filters for a remedy. 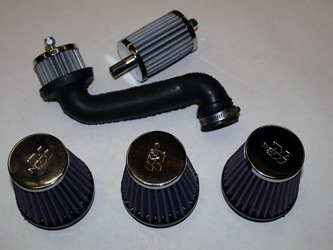 3 individual cone shaped cleaners, a filter to neatly fit the transmission breather hose and a cam-box filter. 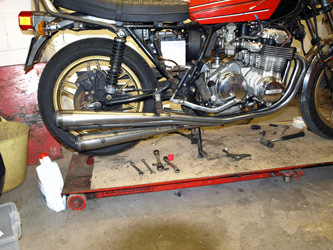 17) The Benelli Sei Special starts to take shape. The shot-blasted and undercoated new metalwork is trial fitted on the frame to make sure it all fits correctly. 18) More of the Benelli's components are shot-blasted to rid them of their 30 odd years of corrosion. 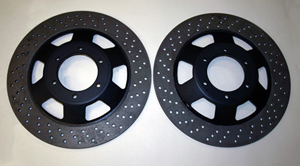 The now 3 drilled brake discs can be clearly seen. 19) An unusual choice of foot pegs and possibly bordering on 'bling' but one that Alan believed suited the bike better than the boring original Benelli items. 20) The fully rebuilt front forks with freshly re-hard-chromed stanchions by AM Philpot and fully smoothed and polished aluminum legs. All having also undergone bush and seal replacements. 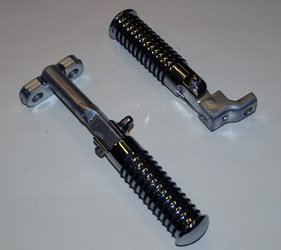 21) The Benelli's brake components all came in for major upgrades and fresh ideas. 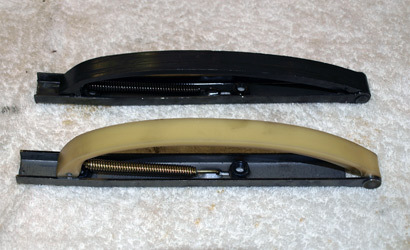 Here the front discs have been cross-drilled and repainted. 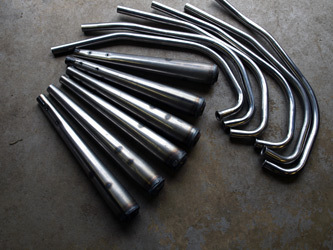 The cross-drilling assists in brake cooling as well as speeding up brake efficiency when wet. 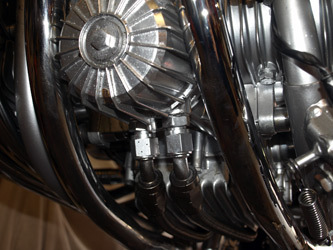 22) Benelli's six cylinder engines are wide with their vulnerable electronics (ignition system on the rhs & alternator on the lhs) residing at each end of the crankshaft. 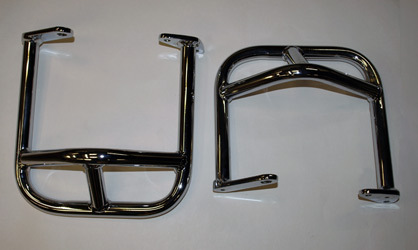 These purpose made side crash bars were custom made by DULA Engineering should save the day.